FILE PHOTO: Flag of PetroVietnam flutters next to Vietnamese national flag and Communist Party flag in front of the headquarters of PetroVietnam in Hanoi Jan. 11, 2016. Vietnam's first move to prosecute a former politburo member widens the country's crackdown against graft to appease a restless public and protect fast economic growth. Police arrested former lawmaker and Communist Party official Dinh La Thang earlier this month over crimes he is suspected of committing as board chairman of the giant state-run oil firm PetroVietnam, Vietnamese news media say. The man who was voted out of the ruling Communist Party’s politburo in May joins a list of other officials in state firms who authorities are targeting in an extensive 2017 anti-graft campaign. The campaign is aimed at easing public criticism of corruption and protecting economic growth of about 6 percent per year since 2012, experts say. 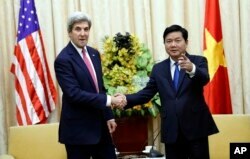 Secretary of State John Kerry, left, shakes hands with Secretary of the Ho Chi Minh City Party Committee Dinh La Thang before their meeting, Jan. 13, 2017, in Ho Chi Minh City, Vietnam. “In part, the campaign is intended to tackle rampant corruption, which is challenging the legitimacy of the ruling Communist Party among the public,” said Murray Hiebert, deputy director of the Southeast Asia Program at the Center for Strategic and International Studies think tank in Washington. “Graft has resulted in massive losses at the state-owned oil and gas company and some banks, which is prompting considerable grumbling among people on the street,” Hiebert added. Thang, 57, is Vietnam’s most high-profile “political casualty” in a broader anti-corruption effort, the VnExpress International news website says. He is charged with “deliberate violation of state regulations on economic management, causing serious consequences” over suspected violations and mismanagement at the oil firm. He's hardly alone in 2017. Anti-corruption work this year led to trials of more than 50 former bank and energy company officials in September. 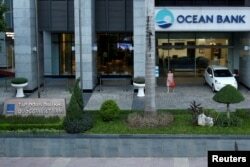 That month the Ministry of Public Security began investigating three companies under PetroVietnam on suspicion of trying to divert $5.2 million from the domestic financial institution OceanBank. The bank’s former director general received a death sentence for embezzlement. This month the former chairman of state-run Vietnam Rubber Group and four leaders of offshoot companies received prosecution orders, the country’s news media reported. They had invested in areas outside their legal boundaries and mobilized capital without permission, according to the news website VietnamNet Bridge. A woman walks out of a branch of Ocean Bank located in the PetroVietnam building in Hanoi, Vietnam, Sept. 1, 2017. And in July Vietnamese intelligence agents kidnapped fellow countryman Thinh Xuan Thanh in Germany. He was wanted for corruption and property misappropriation. 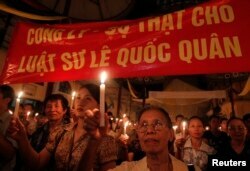 Ordinary Vietnamese gripe about corruption - from bribes paid at routine traffic stops to shady land-use deals. For that reason, stories in the news about court cases against high-level corruption suspects get ample attention, scholars say. “They relish, because of the news publicity, tales of the high and mighty and their cars and villas, and they've got their comeuppance,” said Carl Thayer, Southeast Asia-specialized emeritus professor at the University of New South Wales in Australia. Transparency International, a nonprofit that tracks graft worldwide, ranked Vietnam among the worst (at 113 of 176) countries and regions evaluated in 2016 for perceptions of corruption. Government officials have already improved the transparency and electronic processing of licenses, birth certificates and moving household registration, said Frederick Burke, partner with international law firm Baker McKenzie in Ho Chi Minh City. The ruling party and government mount an anti-corruption campaign “every few years” to show the public they are taking the (graft) issue seriously, Hiebert said. “I think if you look at the corruption index in the world, you can see Vietnam is one of the most corrupt countries, and I think that according to some public opinion surveys in Vietnam, many Vietnamese citizens think Vietnam is one of the most corrupt countries in the world,” said Trung Nguyen, international relations dean at Ho Chi Minh University of Social Sciences and Humanities. Ridding state-owned firms of corruption will help the Vietnamese economy by making those firms more attractive to investment and more viable overseas, analysts say. Vietnam’s economy grows now mostly on investment in the private sector, including foreign-owned companies, but 40 percent of the $202 billion GDP rests on the revenues of state-owned companies, a hallmark from decades of communist rule. That figure stood around 80 percent two years ago. FILE - Anti-corruption activist in Hanoi. Since the 1990s, government agencies have sold thousands of state-owned firms, known often just as SOEs, to ease losses. The government is now starting to privatize giants such as an airline and a liquor firm as it tries to ease budget deficits. Heads of some SOEs with no profit incentive might sign a “cozy” supply contract and divert proceeds into the families of management, Burke said. “SOE reform is one way to get corruption under control, because as soon as you subject these SOEs to the real discipline of the market, the scrutiny of the market, the transparency of the market, then you just can’t get away with some of these abuses,” he said.